Just other day I came across a book on Delhi. It actually enticed me to revisit Delhi once again. With monsoon coming in and the weather becoming more and more pleasant I thought of starting my trip right away. With this excitement I visited Hauz Khas Village last week. To my surprise i find it entirely a different place…. Going through the narrow lane of the so called village I saw quite interesting boutiques, art gallery, restaurant and cafes… all full with young crowd. It felt like I was in a college campus. Just after crossing the narrow lanes we were into the ruins from the 14th / 15th century (Tughlaq dynasty). 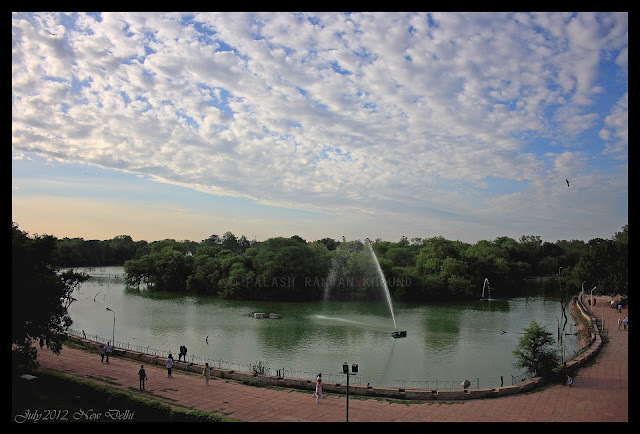 … Overlooking the ruins you can see the royal pond (Hauz Khas) built during the same time… The renovated lake looks stunning with clear weather (No dust because of recent pouring)..